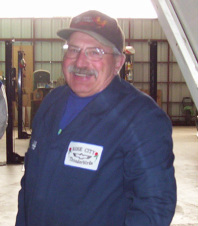 Cliff Noxon was a unique member of The Rose City Thunderbirds. From the day he joined he was involved in serving the club. More often than not another person was recognized for having done something for the club but Cliff was behind that person seeing to it that all of the details were covered. He never sought recognition but always made sure others received it. After his passing in 2011 the club created the Cliff Noxon Memorial Service Award. It is only given out once per year to a deserving person. To be considered for recognition the nominee must have been in the club for at least 10 years and not currently one of the elected officers. 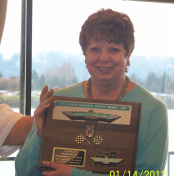 The 2011 Award was presented to Diane Noxon and posthumously to Cliff Noxon during our 2012 kick-off luncheon. The 2012 award was presented to Loren Wagnild during our 2013 kick-off luncheon. The 2014 award was presented to Dave & Barb Van Winkle during our 2015 kick-off luncheon for their many years of service to the club. The 2015 award was presented to John Sailors during our 2016 kick-off luncheon for his many years of service to the club. The 2016 award was presented to Jerry & Sharron Sharp for their years of service. They have hosted so many events at their home and shop that it is impossible to count them. They have also been involved in the planning of all of the CTCI conventions that our club has hosted. The 2017 Cliff Noxon Memorial Service Award was presented to Bob & Carol Murray during our 2918 Kick-Off dinner. Bob and Carol are the last remaining original members of the club from 1972. They both served in several capacities over the years and through Bob we are able to use the Local 290 Union Hall for many of our meetings. Carol was unable to attend the dinner and is not pictured. The 2018 Cliff Noxon Memorial Service Award was presented to Roger & Ruth Kelley at our 2019 Kick-Off dinner. They joined the Rose City Thunderbirds in 1984 and immediately became active members. Roger has served as President in 2001, 2002, 2010 and was just elected again for 2019. Ruth has served many years on the Calling Committee and has worked along side Roger when he was President and planning numerous events. Again with Ruth at his side Roger chaired the 2003 and 2008 conventions that we hosted for CTCI. Ruth was unable to be at the dinner so is not in the photo. Congratulations to Roger & Ruth.